1) Does the car run? Other variations of this question are: When do you tow the car in? Do you leave the car here between games? Yes, the car actually runs. It is in reasonably good shape, there is just a few exterior defects that I have not done anything about. I actually spend a fair amount of time in the off season working on the car. You would not believe how much effort it takes to keep that car in such good shape, yet still look so ugly! 2) How do you heat the food? This question always kills me, because we are usually standing directly adjacent to the car when it is asked. I did not think that the pans of flaming charcoal could be any less obvious, yet people will stare right at them and be clueless. Some people think that there is no engine and I have the fire under the hood. 3) What is in the bowling ball? It is a 100 proof cherry liquor called Wisniowka. That stuff is absolutely horrible. I brought a bottle to the tailgate in the late 80’s as a joke, just to have a good laugh about why would anyone would actually drink that. I guess the jokes on me since we have gone through over 600 bottles since then. 4) Are you married? Kids? Yes, married and have 3 kids (19, 17, 11). This surprises a lot of people. They seem to just assume that I must be single to host such an exotic tailgate and to have attended every Bills game (home and road) for the last 10 years. That’s 165 games and counting. I always say there are only two things that one needs to be able to do what I do… A slightly above average income and a VERY TOLERANT wife. 5) Who pays for all this? I do… and I do not take cash donations, although I’ll never turn down non-cash contributions. Pizza Pete, who runs the pizza oven (a filing cabinet), does supply the ingredients for the pizza. It’s his own special recipe he prepares at home. 6) Does this car go on road trips? No, it is a Bills stadium tailgate car only. For road trips I join up with the various Bills backers organizations around the country. I do bring the bowling ball and a few bottles with me for bowling ball shots. 7) How old is this car? 8) Do the police ever stop you? I have never been stopped while driving the pinto, but I have seen cops point and laugh when I go by. Toll booths are always fun also… I get a good double take when I go through. 9) How long do you think this car will last? There still are model T cars from 1918 still driving around, so based on that I would assume that there are at least 60 years left. It just takes a bit of work each year to maintain. 10) How many miles are on the car? 168,000. Although a better judge would be how many miles on the engine (16,000). In the early 90’s I completely rebuilt the engine and everything attached to the engine (starter, alternator, etc). Based on that this car is just a baby! The Pinto tailgate party began in the late 80’s. There is no clear year that can be picked as to its birth. The red 1980 ford pinto wagon was purchased in 1986 for 300 dollars. For the next couple of years we began to develop a reputation of engaging in somewhat bizarre activities. At that time we were parked where the practice field now stands. If you follow the access road to the southeast corner of the practice field, you can still see one of the guardrail posts spray-painted yellow — that was our spot. It was in 1989 that the first grill appeared on the hood of the car. I built an all-wooden grill from plywood and 2X4’s, filled with charcoal. This seemed like a good way of getting some great burgers, cooking them on a flaming grill. Having not built any legs I put the contraption on the hood of the pinto. I did not think the hood would be damaged before our burgers got done. Alas, the plywood burned through faster than expected and a little burn mark appeared on the hood. Never to be beat, I came back the next week with a triple plywood grill to give it another go. That burned through also, increasing the size of the burn spot. At this point I decided that I would have to fix the hood (I never did), so for the next couple of games I did not care what happened to it. The next week I placed a metal grill (no legs) on the burnt spot and grilled our burgers. At some point I began to have an obsession with bacon double cheeseburgers. I brought some bacon and first attempted to cook them on the grill grating, then on tin foil. These attempts failed. In desperation (I needed that bacon double cheeseburger), I searched the car and surroundings for anything that would help. I spotted a saw that I had in the back of the car. I placed it across the coals and it worked great! As the years rolled on we added more items to the menu. By the end of the 90’s we were cooking pancakes and omelets on a shovel, chicken wings in an army helmet, burgers, dogs and grilled cheese sandwiches on a rake, a hubcap for stir fry, and a toilet for a beer cooler. The bowling ball shots began in 1990. We had broken our shot glass and someone suggested (in humor) that we use the thumbhole of a bowling ball that was in my car. I guess we never replaced that broken shot glass. I added a bar in 1997, where thousands have lined up since then to get their “bowling ball shot”. I take that bowling ball on road trips to other NFL Cities to bring a little piece of the pinto tailgate with me. The bowling ball has been on the road to every NFL team. In 1997 we also moved to our new location in lot 1, due to the construction of the new practice field. The 2000’s have brought even more items. We added the “pizza oven” — a filing cabinet that we cook pizzas in, an old medicine cabinet was converted into a baked potato oven and a Craftsman toolbox is now our shish-cabob grill. There will be some new features for the 2004 season. The pinto has held up remarkably well over the years. You would not believe how much effort it has taken to keep the car in such good shape, yet still look so ugly. The car was my primary car until 1991 when it retired to become just a tailgating vehicle (my wife was grateful). Just for the record, a 1980 pinto is NOT one of the exploding ones made famous in the 70’s. In 1992 I rebuilt the engine and replaced most of the parts that support the engine (starter, alternator, distributor, etc). Since then only 16,000 miles has been put on the car, so by many standards it is essentially still new. New floorboards were put in a few years later. Every off-season I spend time working on the car. Except for the body, the only original parts left are the engine block, coil, springs, steering box, drive shaft and rear axel/differential. The car has only missed one game. In 1998 against Oakland, the timing belt broke late Saturday night and I had to use my mothers car (no hood cooking allowed!). Through the course of the years the pinto Tailgate has developed many ceremonies and special events, some of which have faded away (such as the beer bottle bowling), others that persist today. Some are every game events (potato chip opening ceremony, ketchup ceremony), others are once a year: wine making, lobster races, our thanksgiving feast, the tiki fish for example. The most popular is the ketchup opening ceremony, which always occurs 1.5 hours before game time. John or Jodi climbs onto the pinto and squirts a 64 ounce bottle of ketchup as high and far as he can. I run under it to sauce my burger. Of course, a significant amount gets on me. This first started back in the early 90’s, but the idea was to get the ketchup on the burger without getting any on me. If I could catch the ketchup without getting a drop on myself, it was a successful event. I’m not sure how it evolved into what it is today, but success today seems to depend on how much of the 64 ounces gets on me. The pinto tailgate would not be what it is today without the cast of characters surrounding it. I am the last survivor from the original crew of the late 80’s. That crew included Frank, Paul, Joe, Bill, Gary and Dave. Some of these guys drop by from time to time. A second generation of pinto tailgaters grew in the early 90’s, most of which still are around: Scotty, Ken, Kevin, John, 3 Mikes, Lisa, Dee (my wife) Pete and Andy. The number of regulars that have showed up in the late 90’s and on are too numerous to mention. Of special mention is Pete Papagelis. He is the pinto “head chef” and on game day probably does more work than anyone there, myself included. The pinto tailgate is an open tailgate party, everyone is invited. Bring your own stuff to throw on one of our grills, or sample some of our fine selections… Lets keep Buffalo the number one tailgating city! 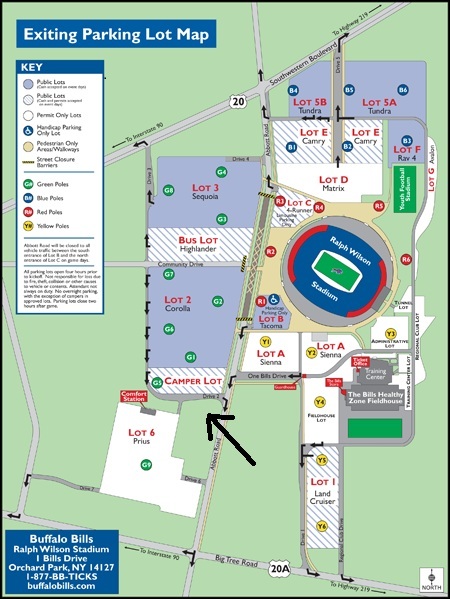 Before many Bills home games, we’re asked “who else is going up” or “where’s the best spot to tailgate.” That’s why we decided to make Kenny’s (or Pinto Ron as he is popularly known) “Red Pinto” tailgate the official NYCBBB tailgate location for all Bills home games! Kenny’s tailgate is widely known, and is often used as a backdrop on TV before Bills home games. It was briefly highlighted on an NFL films segment, and the “Commissioner of Tailgating” considers Kenny an all star tailgating character. He’s recently had write-ups in the Buffalo News and The Indianapolis Star. Most importantly, he has graced us with his presence at every Meadowlands tailgate the last few years. Click here for a complete history. Click here for Kenny’s top 10 questions! So if you’re going up to a game, make sure you stop by Kenny’s tailgate. And be sure to tell him you represent the NYCBBB! Where is it? Here is a map.